change management – Digital Sherpa – I help people on their digital journey. For the 8th consecutive year, @weCONECT’s Intranet Reloaded (#intrelEU) was the leading practitioner gathering around the future of intranets and the digital workplace. Despite the occasional “there are other ways, too, you know,” the dominance of Microsoft Office 365 in the field became even more evident. You (experts) are not the user, you need to take UX and employee experience serious. Mobile access is becoming an increasingly important aspect in the light of a more agile workforce and the need to keep blue collar workers in the game; Deutsche Post/DHL showed this in a quite impressive case for the 8th Intranet Reloaded Awards. A similarly frequent topic was ‘change management’ and the impact of digitalisation on organisation and business processes. My favourites this year were delivered by Martin Wilckens (Deutsche Telekom) and Jacqui Randle ( @jacquirandle1 | Scottish Government). Work 2028 – Trends. Dilemmas. Opportunities. In a nutshell, the counter opposite of the classic German career path. In the future, our commitment and engage for a business, a brand or a person will not last forever. It will be more bound to projects, roles or individual identification with the challenge at hand. As a consequence, companies need to get ready for more frequent on-, re- and off-boarding of employees. Without proper digital support for the employee life cycle, this will turn into HR’s worst nightmare. Even though the report is about ‘unlearning the old understanding of leadership’, what clicked with me was the concept of ‘unlearning’ per se. Looking back at my recent experience in digitalisation projects core to the business logic (sales, legal, technical delivery), the ability to ‘drop the old habits and routines’ was essential to moving towards the new ways of working. It is paramount to the change process that everyone understands that just executing the old ways with new tools most likely won’t deliver the desired result. That’s why we will have to be able to ‘unlearn’ existing (and comfortable) work patterns to move on and unleash the digital potential. Jacqui from the Scottish Government gave a compelling presentation on change and change management in the context of a pretty intranet re-vamp. One that, for example, delivered the ability to onboard new entities on the concept for less than two grand, providing a result that would have cost millions in the past. So a big thanks to Jacqui for that one 🙂 It will stick with me for some time for sure. Make the workshop about “building a strong foundation” valuable by sharing your experience! On April 11th, I will be facilitating a little workshop at the 2019 Intranet Reloaded Conference in Berlin. It will be about building a strong foundation for change for digitalisation projects. The following chart is an outline of the topics I’d like to discuss with the workshop participants. Here’s a little online survey to better understand if the approach goes in the right direction or if there are other topics you want to see on the list. Please help me to make the session as valuable as possible! 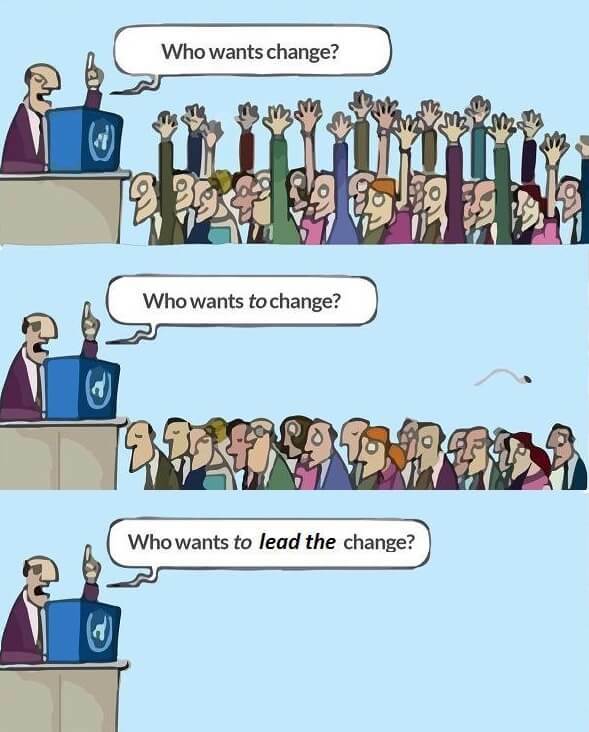 How Leadership Drives Change. Concretely. This week, I spent a lot of time with a group of sales leaders for a large industrial manufacturing firm. In the context of a large digitalisation initiative we discussed the role and specific tasks for leaders to drive and motivate sustainable change. In this post I want to share the essence of the discussion with one of the Senior Leaders in the aftermath of group work with the team. With this model I tried to visualise, where and how leaders “take action”, when it comes to driving change. If you have hired the right people, and if you have managed to put them in the right role, your job is done. If you have to tell people what they are supposed to do, you have got the wrong people on board. Providing guidance for operational work through processes, frameworks or templates still is managerial. Even though some people might be asking for clear instruction and guidance for how they are supposed to apply their skills, I don’t perceive this particular element as “leadership”. To motivate people and make them believe in the value of applying the standards, might be a leadership aspect of this part of “how”. This is where real change kicks in. To motivate change and lead by example when it comes to fundamental change for i.e. the ways of working, is what is expected from leaders. Thinking with the recipient in mind, turning personal experience into corporate knowledge or adopting new digital opportunities isn’t something that can be ordered. It is where leadership meets operations, because leaders will have to show the same attitude and act as a role model. This applies to ways of working, not giving up on adapting new technologies as well as helping others to feel comfortable in the new world. There is no reason, why a SVP shouldn’t be the key user of a new collaboration environment. Excellent leadership in this level will have the effect of empowerment. People will be equipped with the right mindset to put their competence and abilities to full play. Making change stick with rituals, routine & celebration. I have to agree with him, because I have reached the point where I don’t even hear me say the word “change” anymore. That’s probably the destiny of an evangelist: you have to keep saying it, make it tangible and help people to understand what it means. Otherwise it will actually stay an empty phrase for good. Why change is so hard. Triggers to make things stick. Athletes know the drill: without embedding your physical challenge into your daily life every day, there will be no progress. You don’t become a long distance runner with the occasional jog, you won’t get the beach body from the weights you swing round twice month. To establish something new, it’s helpful to have a ritual. Something everyone does, every day, for at least 30 days. Then the ritual becomes a habit and it will be hard to give it up again. Most likely the things to be done will still be there. Not matter if it’s at the work place or anywhere else in life. If you want to introduce “new ways of doing things”, you need to alter existing routines and make room for the new stuff. That “new piece” can be a tool, an approach or simply a way of starting a conversation. We need to be kind to ourselves. It’s not always the won sales deal, the stronger abs or the better time for the mile. We need to celebrate success along the way, the newly established habit or simply the awareness for the new. Celebration is emotional, and positive emotion helps to endure the efforts of change. But be prepared for setbacks! There will be days, where your mile feels like eternity. There will be days, where the scales tell you: nah, not even close. Be prepared for that. Be prepared to be resilient. In business, this means that you have to accept the fact that it won’t be a smooth ride all the time. If a lot of people are confronted with change, anxiety and fear aren’t strangers to the game. New stuff can be scary and people usually don’t embrace change naturally. We need to develop a “we help each other along the way” mindset. We have to tune our radar to capture the little signs of discomfort and intercept early to not even let the bad feeling establish itself properly. We need to learn to care for each other more, also at the workplace. Don’t give up. Don’t fall back to old ways, because you know how to trick and fix them. Share discipline to give it another try. Be in it together to try, fail, try again, fail even harder and then succeed. It will be worth it in the end! Change is a constant in today’s world. BCG’s Jim Hemerling takes about 5 ways to lead in an era of constant change. It was one of the TED talks I watched this week over my home office lunch, my 30 minutes of daily inspiration. With that video I want to close today’s post – because essentially it says it all, and I wish I could spend one dinner with Jim to talk about his talk. There isn’t a better way to put it. Download a PDF of the image here. The interview was conducted in German. Click here for the German (native) and English (translation) version of the interview. * WYZE is a consultancy for for particularly demanding and knowledge-intensive topics in the fields of transformation, change, positioning, and marketing. As a coach my goal is to work not just for but with people. A genuine interest in the emotional state of others is an essential part of what I do. To sharpen my empathy radar and to improve my ability to observe how others feel in a particular situation, I’ve started my journey into mimic resonance training (in German Mimikresonanz). Identifying an emotion in someone’s face should not be confused with mind reading, trickery or lie detection. The TV series “Lie to Me”, while highly entertaining to watch if you’ve started to train Facial Action Coding yourself, has undoubtedly contributed to some such confusion on the subject. The deeper purpose of mimic resonance as a methodology for acting on empathy however, goes way beyond unveiling a lie. In business – and undoubtedly in private lives – communication is too often a one way street, the sending of a message. But if the effectiveness of communication is your objective, simply “getting it out there” isn’t enough. How a message is perceived, what recipients have understood and how the words resonate with the audience are key to ensuring a communication goal is really achieved. The ambition to formulate a message with little room for interpretation is certainly a good start. Conveying a message face to face theoretically allows us to actually see how the content resonates with the other person. In the age of digital communications, the face to face option is often missing, leaving our empathy radar more or less blind. Maybe in the future we’ll be able to develop a way to create feedback loops for the digital world – perhaps with emoticons. But for the moment, this form of improving communication and ultimately relationships rests firmly on the premise that we do not replace personal interactions completely with digital ones but rather the two complement each other. I’m thoroughly convinced that it’s essential to remove guessing games from interpersonal communication and to do whatever we can to sharpen our observations of non verbal feedback in any face to face situation. Mimic is built into us as humans. It’s there from birth and it is scientifically proven that expressions in our mimic are universal across all cultures. It’s a truly reliable indicator for our emotional state as human beings. But the real challenge is in learning to resonate on what you observe in someones mimic. As opposed to the “mind reading” (I know what you’re thinking) angle, observing a particular mimic, identifying it, and matching it to the respective emotion is essential. But questioning that emotion, its origin and cause is paramount to real understanding. Any sort of unfounded interpretation can easily lead you down the wrong path. The training I’ve started will improve my ability to observe what’s happening right before my eyes and how to react to it. My goal is to sharpen my sense of people’s emotions and my skills to find the right words for the situation at hand. Have people understood the WHY to our journey ahead? How do people feel about the changes affecting themselves and their teams? Are our teams confident and committed to their role in the process? Is our leadership model authentic and does it resonate with the organisation? Will our work deliver value for the people, employees and customers alike? Have we forgotten about middle management? While working on a series of articles for a client (<— #braggingmoment), I’ve stumbled across an intriguing question: who’s actually in charge of keeping an eye on middle management and their needs and role in digital transformation? Bam! You’re now a coach. Flat hierarchies, agile teams and distributed accountability – the new world of organising information and knowledge work. Leadership doesn’t get tired of preaching a “new togetherness” and how the own network of expertise and experience will blow the competition out of the water. More and more employees ask for flexibility and freedom to do their job whenever, from wherever and with whatever – and that’s not exclusive to Digital Natives or Generation Z. The middle (or operations) management, however, only finds itself in foot notes and at the bottom of a bullet point list. From there they learn that task based management is out of date and how too much control & conquer will suffocate creativity and corporate culture. They find their new roles described as coaches and guides to their teams. Most of the time description ends on exactly that level, though. But what does it mean to be a coach? What will they be guiding people through and how will good guidance be determined? To give change a positive and long lasting effect on corporate and collaboration culture, middle managers need help with their role transformation as well. It’s not fair to expect that they just adapt to a completely upside-down environment and adjust their style of working and managing based on gut feeling and best effort. No matter how non-hierarchical or flat a company structure is, there will always be a certain group of people who are accountable for overseeing performance and results. Leadership cannot be at the stern and at the same time have an eye on every functional crew member of the ship. At least that’s my humble opinion, and I am aware that there are a lot of other voices out there. Middle management has to be part of the active change management in an organisation – in the role of recipient and as shapers. Additional thoughts on this, anyone? The inspiration for this blog post comes from “Hidden Brain“, an NPR podcast series. One of the latest episodes in the You 2.0 series, Check Yourself, is about the history and the impact of using of checklists in aviation and surgery. While listening to the podcast, I realised a similar pattern of “we know what we’re doing and we are in-line with everyone involved” attitude in a lot of people I’ve worked with in the past. This attitude, however, is not rooted in arrogance or ignorance, but in the confidence in professionalism, dedication and motivation of the surrounding system. I believe, that – like in aviation and surgery – it could be beneficial to ask some fundamental questions before embarking on the journey of a digitalisation project or program. At least it’s my experience that in a lot of cases, the ticks in the boxes were what was missing in the foundation for joint success. Too many initiatives lack stability or credibility simply because of a lack of alignment and transparency. Just recently I’ve added a little “Digital Sherpa in a Nutshell” section to my website. Based on the four key dimensions of my work as a coach, I’ve created a little checklist, that I’d like to share with anyone interested out there. I’ve recently decided to get certified as a trainer for mimic resonance (English introduction to the concept on the MDI training website) and attend a course at the Eilert Academy. As part of my studies, I came across some findings on motivation in the context of personality types. The section in Dirk’s book immediately reminded me of an idea, that I wrote about in my 2012 article on motivation. Comment: My reference to the conditioning of people as preservers or thinkers is based on my experience how people act at the work place. It’s not a generalisation in terms of personality types and of course influenced by the cultural environments I’ve worked in. Entertainers & Doers are primarily motivated TOWARDS something. Preservers & Thinkers are primarily motivated AWAY from something. My experience with the effectiveness of motivation and leadership might be rooted in the personality structure of most organisations. Today’s hierarchies and operational structures have prevented the development of Entertainers (yes, we need those!) and Doers (no, we don’t have enough of them). Too many people are pushed into Preserver and Thinker roles and act accordingly. Do you share this finding?